Camping Le Neptune is a relatively small 4 star campsite that lies in a fantastic location between the beach resort of Argeles-Plage and the stunningly beautiful Alberes mountains. Although smaller than many other campsites in the area, Camping Le Neptune offers everything that you could both need and want whilst on a camping holiday in the south of France. One of the best ways to explore the area is by foot or bicycle. There are miles of footpaths and cycle tracks around the area which will allow you to get out and find out why this part of France is so popular. The campsite is styled in a Mediterranean theme with plenty of colourful plants and flowers dotted around the site. There are also a number of palm trees and bushes offering a degree of shade from the warm summer sun. The nearby mountains also offer the perfect backdrop to this beautiful campsite. If you’re looking for a campsite near to the sea then you won’t be disappointed by Camping Le Neptune as it’s only around 500m away from the beach. Long and wide, the beach stretches out for some distance in either direction giving you plenty of space to call your own. Swimming, sunbathing and plenty of water sports activities are available nearby to the campsite so whether you want somewhere to relax or a bit of fun and excitement you’re in the right place. The campsites pretty pool complex is a great spot for relaxing whilst the kids splash around. Sun beds, chairs and palm trees adorn the patio area whilst the children’s pool, lagoon styled family pool and water slide provide the fun. Camping Le Neptune campsite offers a comprehensive selection of activities and facilities on site and also nearby to ensure you have a fantastic family holiday. 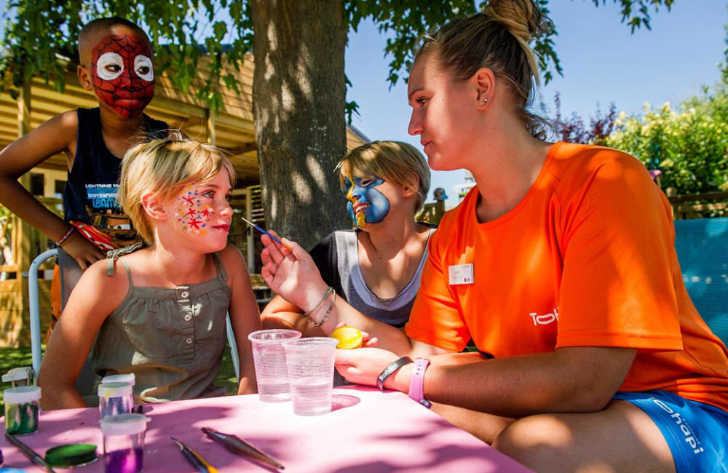 On site activities at Camping Le Neptune campsite include boules, multisports area, football, basketball, volleyball, table tennis, sports and fun activities, sauna, spa, steam room, massages, a playground and cycle hire. Facilities available at Camping Le Neptune campsite include WIFI, restaurant, takeaway, snack bar, pizzeria, bar, bakery service, animation team, washers and dryers. Accommodation at Camping Le Neptune campsite includes a range of 2 and 3 bedroom mobile homes and tents that are available from Suncamp.